Depending on the classification or “schedule” of the drug, distributing, manufacturing, or possession will have their own serious and expensive consequences. If you, a loved one, or a friend have recently been arrested for distributing, manufacturing, or possession of illegal drugs and substances, you know bail can be really costly. At Indiana Bail Bonds, we are able to help individuals with bail for possession of drugs in Avon and Indianapolis, IN or with distributing and manufacturing. We are available 24/7, offering expert service at an affordable price. We know this is a scary time and that you want to prepare for your hearing, so we work hard to get you released from jail so you can go about your day to day life. Give us a call now at 317-423-9300 to speak to a bail bond agent about our bail bonds for drug charges. 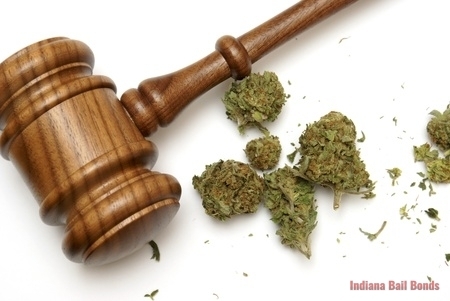 No Matter the Schedule of the Drug, We Can Provide Bail for Possession of Drugs in Indiana. In the state of Indiana, the classification of drugs is determined by a schedule, or how addictive a particular drug or substance is. There are five types of schedules used to classify the severity of the drug. Schedule I includes drugs like benzylpiperazine, heroin, LSD, mescaline, MDMA peyote. Schedule II is for drugs like amphetamines, crack, methadone, methamphetamines, morphine, oxycodone, opium, and PCP. Schedule III are getting progressively less severe and include codeine, ketamine, steroids, and, testosterone. Schedule IV are drugs that are still seen as a risk but are sometimes used for medical purposes and these include alprazolam, clonazepam, and tranquilizers. Schedule V drugs are considered lower dependency drugs with a lesser chance for people to become addicted and these include codeine and Tylenol. Charges for drugs are all determined by what drug schedule you had, sold, or made, and how much. Drug charges can range from a misdemeanor to a felony. Let our bail bondsmen help you today with your bail for possession of drugs by calling us today. Whether you need bonds for a misdemeanor, a felony, or you need a surety bail bond, at Indiana Bail Bonds, we are able to help you with your bail for possession of drugs in Austin, TX, or with manufacturing and distributing. We are able to go through the entire bail bond process with you when you call and get you out as soon as possible. Give us a call today at 317-423-9300 for reliable and professional bail bond services. Updated on February 1, 2019 at 2:47 pm by Indiana Bail Bonds.